I have a race update and I will just go ahead and warn you that this is not the peachy happy its all good race update like some. This race was soooooo NOT my favorite race. 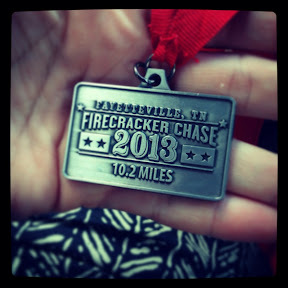 First off, yes I finished it, but I think I could have been convinced to quit any time after mile 6. We started the race off at 7am. It was incredibly organized and from what I could tell started on time. The biggest problem for me was the heat. I have been incredibly worried about running a small race, especially this small, because I don't want to finish last but thankfully my niece was running this race too and she ran the whole thing with me. By the time we got to mile 5 it had been about 1945 miles since the last water stop. I was dying of thirst and the temp was just getting higher and higher. I took a Hammer Gel at this stop and just knew that was going to help, it didn't, I just got slower and hotter from there. Once we got to mile 6ish we turned on to a road that was flat for the most part, it had zero shade, and it was the last 4 miles of the run. This was also pretty much the last time I ran on the whole race. We walked to the top of a hill and trotted down and crossed the street at a run but that was pretty much it. This road was just blazing hot. This is also when I started taking my water breaks and putting one in my belly and two all over my body. I say that like we had lots of water breaks but there were just 2 on this 4 mile stretch. My sister did call while we were running and than the Lord she brought us a water while we were on the road. This bottle of water might have saved my life!!!! The last mile was the worst, I had just killed the bottle of water and my belly was starting to hurt. I was so hot I kept thinking that I could be sick. 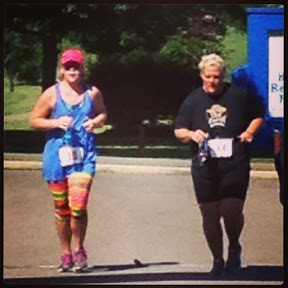 We ran the last 40 yards to the finish line and then I ran to the shade and sat down with a bottle of water. I was not sure that I was not going to be sick. I was just smouldering at this point. I couldn't even talk for fear that it would be followed by vomit!!! Oh, and we finished last! I FREAKING HATE BEING LAST!!! But again my sweet niece was right there beside me, she is an athlete so I know she hated being last but she never complained once about the speed we were traveling. After we finished my sister and bro in law took us to Blunch. I had to sit on the ground for a few minutes before I could get in the car to go eat. We went to one of my favorites and I couldn't even eat. I was still so hot that I couldn't stomach my food. I just needed a cold shower and a nap. When I finally got home I stayed on the couch pounding water for a while before heading to dinner. I finally got my appetite back, and it came back with a vengeance! I had a few slices of pizza, I figured that wouldn't kill my weigh in Monday since I had burned 409,83 calories and not taken any in. Now we are 1 day away from the completion of Phase 2 and even more exciting we are 14 days away from the Triathlon!! !